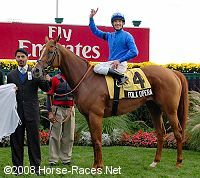 Trainer Saeed bin Suroor leads Folk Opera and Franie Dettori to the winner's circle after the 2008 E.P. Taylor Stakes. The $1 million Emirates Airline E.P. 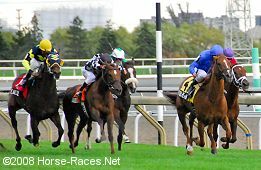 Taylor Stakes (G1) is the distaff counterpart of the Canadian International, featuring older fillies and mares looking for a guaranteed spot in the Breeders' Cup Filly and Mare Turf, to be run on October 24 at Santa Anita. A field of nine assembled for this 1 1/4 mile trip over the E.P. 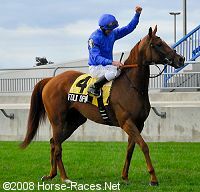 Taylor Turf Course, with Godolphin entrant Folk Opera sent off as the 3-2 favorite, exiting an 8th place finish in the Prix Vermeille after winning the Prix Jean Romanet. In to challenge the Saeed bin Suroor trainee included 7-2 second choice Hostess, winner of the Glens Falls at Saratoga last time out for trainer H. James Bond, and 4-1 third choice J'ray from the barn of Todd Pletcher, winner of the Canadian Stakes at Woodbine, the major local prep for the Taylor. Folk Opera leads down the stretch with Callwood Dancer and Sealy Hill to her outside. Regular rider Frankie Dettori immediately sent Folk Opera to the lead and over to the rail to save ground. 28-1 Green Lyons, 9-2 fourth choice Toque de Queda, and 13-1 Callwood Dancer stayed up close to the pace for the first mile, as Folk Opera clicked off easy fractions of 26.41, 51.55, 1:16.66, and 1:40.80 over the officially firm going. With 2 furlongs remaining, Dettori asked Folk Opera for her run and got it, as she quickly opened up a 2 length advantage over Callwood Dancer at the 1/8 pole. Folk Opera, taking full advantage of her slow early pace, had plenty left late and cruised under the line 1 3/4 lengths in front of Callwood Dancer completing the 1 1/4 mile trip in gate-to-wire style in 2:03.70. It was just a head back to late-running 11-1 Sealy Hill third. 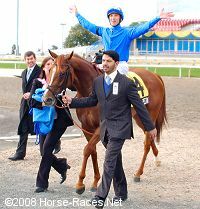 Left: Folk Opera in the winner's circle with trainer Saeed bin Suroor at her head. Suroor said, "Before the race I thought she might be a little bit fresh, a little keen, so it was a brilliant ride from Frankie. But today she is in a different class to the others in this race. She ran and won a Group 2 in France last time. Today was perfect for her, the ground and the distance. We talked to Frankie and told him just to keep her close in the race because that is what she likes. We could take the filly to the Breeders' Cup after this. 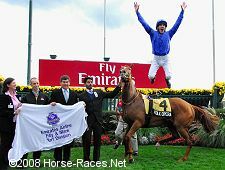 It will depend how she comes out of the race"
Right: Frankie Dettori makes his traditional flying dismount as he does after every Grade 1 win. Left: Frankie Dettori celebrates as Folk Opera returns after the race. 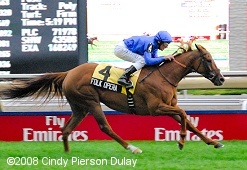 Dettori said of the slow pace, "It was a gift. I was pleased with her going into the first fifth of the race. I knew she would be very hard to catch." 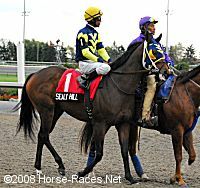 Right: Folk Opera was a bit skittish as she entered the paddock before the race. 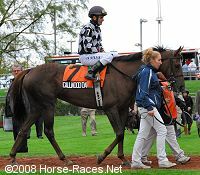 Left: Second place finisher Callwood Dancer heads out of the paddock before the race. The 13-1 shot raced in fourth for the first mile under regular rider Eurico Rosa da Silva while never mode then 2 1/2 lengths off the lead, passed the tiring Green Lyons and Toque de Queda late but was no match for the winner, finishing second beaten 1 3/4 lengths at the line. The Roger Attfield trainee improved her record to 6 wins, 3 seconds, and 5 thirds in 18 starts, earning $716,449 for owner Harlequin Ranches. Right: Third place finisher Sealy Hill in the post parade. The 11-1 shot raced about 4 lengths off the pace in 5th early under regular rider Patrick Husbands, closed late on the turn but encountered traffic trouble, angled out for room and closed well to finish just a head back of second place, officially 1 3/4 lengths back of the winner. 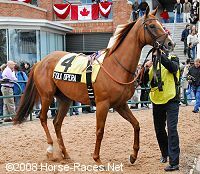 The Mark Casse trainee, who is Canada's 2007 Horse of the Year and Triple Tiara winner, improved her record to 7 wins, 3 seconds, and 3 thirds in 17 starts, earning $1,380,142 for owner-breeder Eugene Melnyk.